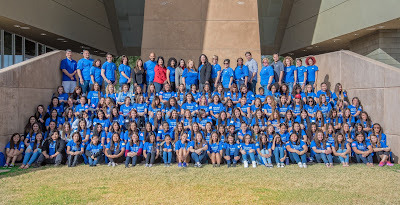 Last Friday, over 150 Latina high school students gathered at the Chandler-Gilbert Community College (CGCC) Pecos Campus for the Hermanas: Diseña Tu Futuro (Design Your Future) Conference sponsored by CGCC and the Intel Corporation. Students participated in a day of discovery in the areas of science, technology, engineering and math (STEM). The conference, which promotes STEM careers as a viable option for young Latinas, was broken out into career workshops, a town hall meeting and a college fair. The workshops focused on topics such as chemistry, solar and bioengineering and provided an atmosphere for participants to learn about the subject matter and career paths that may correspond in that area. The town hall allowed Latina professionals in STEM careers to interact with a room full of inquiring students by both answering questions and sharing their stories. The college fair placed students in front of participating school representatives as an opportunity to learn about programs offered after high school and to begin building a network into key institutions. These institutions included Arizona State University, Grand Canyon University, Northern Arizona University and the Phoenix Science Center among others. “We certainly pack a lot into one day, but we make an effort to approach STEM from many different angles in order to give these students every opportunity to make a connection with this rich subject matter and potential career path,” explained Reyes.